Triton. 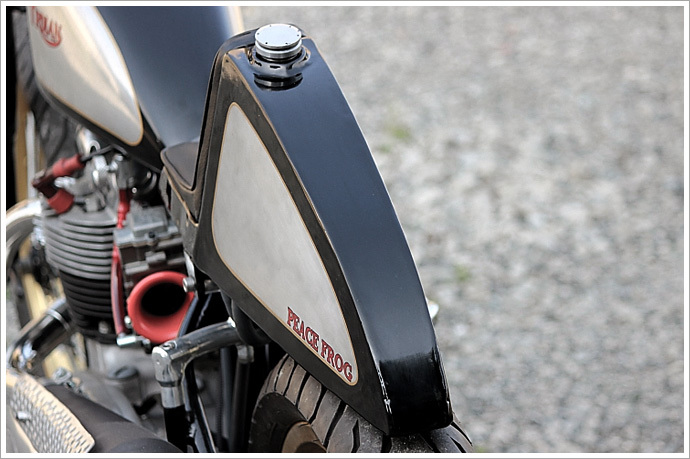 The name raises the hairs on the neck of any dyed-in-the-wool café racer. Often cited as the genre’s ultimate engineering expression, it came into being due to the fact that the 60’s best engine and frame just so happened to exist in two completely different bikes. Norton’s Featherbed frame was more than a match for their temperamental 650 and 750 twins, yet Triumph’s T120 650 engine was well known for reliability and a fondness for mods, but alas it was trapped in an average frame. Then hey presto, the Triumph-engined, Norton-framed ‘Triton’ was born. 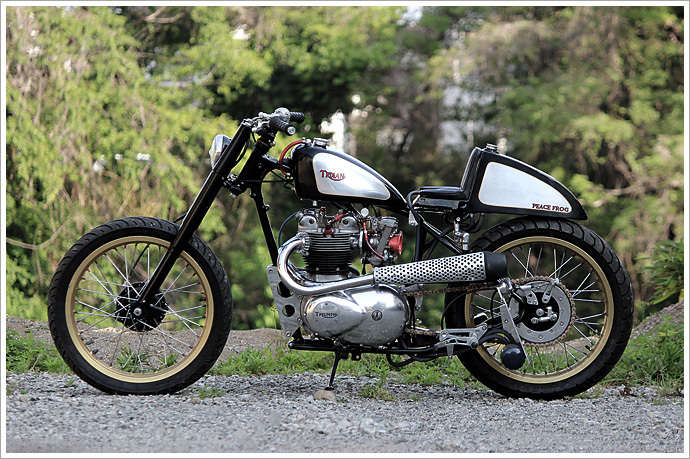 And the Tribsa, the Norbsa, the Norvin… and the Trdian. No, we hadn’t heard of it either, until a few days ago. And now we can’t get enough. 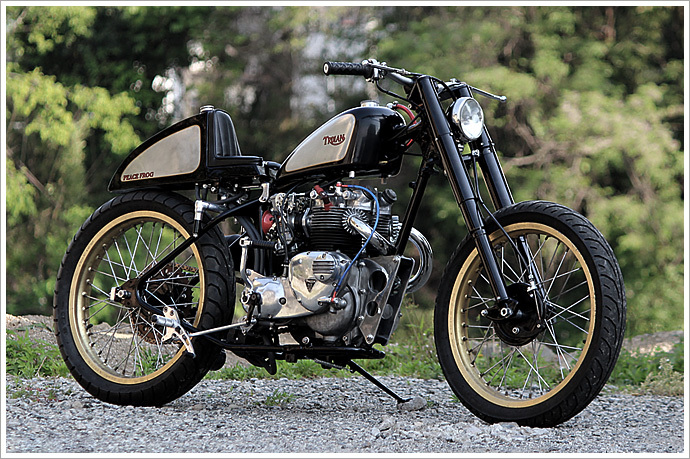 Meet the world’s first Triumph Indian, Peace Frog’s rather amazing new ‘Trdian’. We guess the real story here, apart from the fact that we aren’t aware of any other Triumph/Indian hybrids in existence, is that Peace Frog’s build is also an amazing cross-pollination of British and American engineering, and it was imagined and created by a bunch of guys in Kumamoto, the capital city of Japan’s southern-most island, Kyushu. It’s like the United Nations, but with bikes instead of hot air. And much cooler, too. Now, we’ll readily admit that the bike has a rather peculiar retro style at first glance. 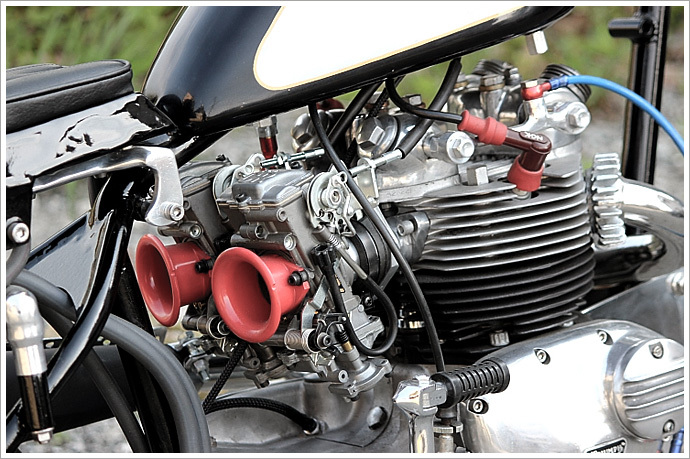 The meaty 500cc engine. The delicate Indian frame. It’s one that somehow manages to look both delicate and mean in the same blink of an eye. 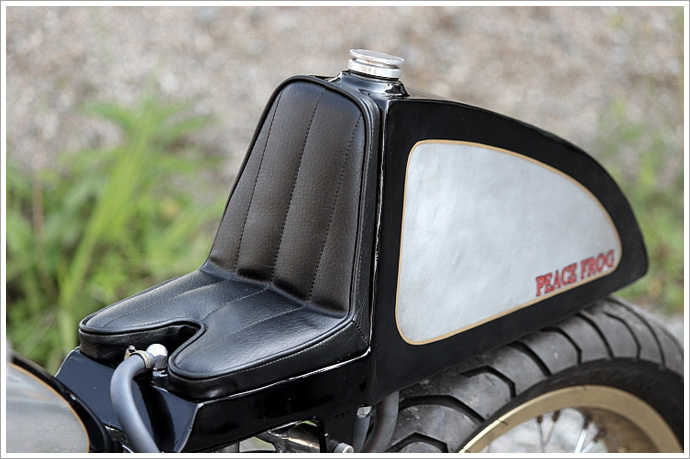 Then you notice the seat cowl that also serves duties as the bike’s oil tank. Expected? No. Delicate? Uh-uh. Full of win? Yes and yes. And look at that svelte rear profile. 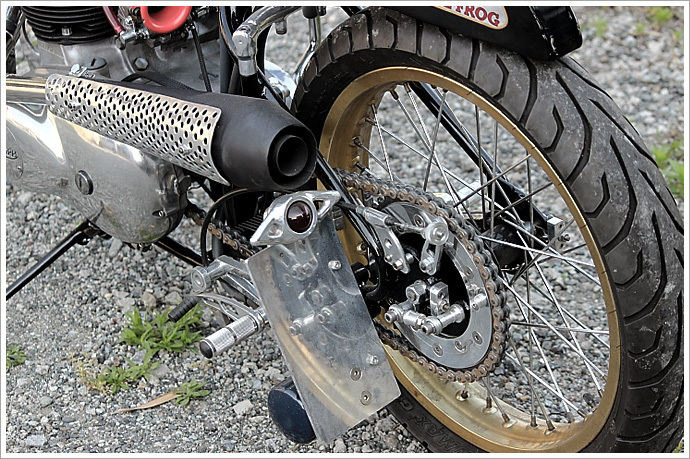 Closer inspection of the bike’s details reveals a raft of hand-made items adorning it including the ‘bars, fuel tank, and foot controls. In fact, most of the bike’s body bits are bespoke, yet somehow they manage to look so simple and work amazing well in harmony. Which is quite an impressive asthetic statement from a country that also created the bōsōzoku craze. The bike’s fed the all important go juice through a new set of Keihin CR carbs. We;re guessing they’d be some fun to open wide sitting on an engine like that, you think? 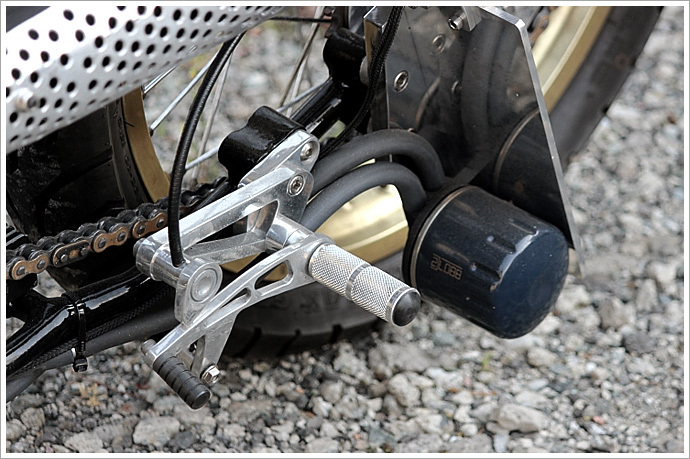 Holding up the front end is an original set of Indian telescopic forks spinning Dunlop ArrowMax rubber, and holding up the rider’s feet is a set of custom-made foot pegs protecting what has to be the most original oil filter placement we’ve ever seen. For more on this rather enigmatic Japanese shop, be sure an visit their blog here. And if you like what you see, their previous build was featured over at EXIF a few years back.